Your router might just be the most under-appreciated but essential part of your home or office. Whether you’re a PC gamer looking for the best, customizable wireless connection possible, or simply want easy, whole home/office coverage, then we know a router that will get the job done. 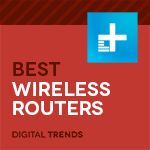 Welcome to our list of the best wireless routers you can buy. This Nighthawk is the least expensive option in the Nighthawk family, which means you get most of the excellent Nighthawk benefits, but at a much more affordable price. AC1750 (450 + 1300 MBps) may not be the fastest router speed around, but it’s definitely enough for the average home, and you still get powerful features like beamforming, which targets connected devices to help avoid dead zones, and a dual core processor for managing the network more smoothly. The router comes with parental control options, backup software, and a USB 3.0 port for connecting your stored media. Basically, it’s everything you could want in a home router without the need to spend hundreds of dollars. Maybe you’re looking for more speed, more power, and you don’t mind paying extra for it. This TP-Link model is one of the most powerful models we’ve seen, a tri-band router with a 1000 Mbps 2.4GHz band and two 2167 Mbps 5GHz bands. That’s enough for all your 4K, games, and intensive file transfers. It also has MU-MIMO support for target a few devices with extra-reliable connections, and smart features that function with Alexa and IFTTT for easier device control. You can even set up a personal VPN via built-in software options to create some extra privacy. All this makes this TP-Link model one of the best routers on the market, excellent for a busy family with plenty of streaming-focused mobile devices, or an at-home business that may need extra router capabilities. Google’s Wi-Fi routers are an excellent example of a mesh network router, where multiple devices can link together to form a wireless network with bigger, better coverage. That makes this router pack ideal for large spaces or homes that struggle with a lot of dead zones and interference. A single point can cover around 1,500 square feet, while three of them cover up to 4,500 square feet. They include intelligent network access, which means they’ll give bandwidth priority to the devices most in need of it. Each router by itself isn’t particularly powerful at AC1200, but together they can help smooth out any rough spots in connection quality so you don’t experience any problems. You can buy a single Wi-Fi hub for $130, but there is a three pack deal for those with large homes that can be found for between $250 and $300 depending on where you shop. Looking for a budget router? This $50 TP-Link will see you through! It offers AC1200 dual band speeds, two USB ports, and Gigabit Ethernet ports to manage your modern net connection. Those aren’t earth-shattering specs, but they are the important basics you need for a good Wi-Fi setup, and TP-Link’s Tether app is one of the better router apps out there, so setting up and managing the router shouldn’t be a hassle. It’s a perfect fit for a home that only needs a simple net connection for every email, browsing, and some light streaming. However, if you plan on streaming 4K content or other data-heavy tasks, then you may want to upgrade to a more powerful model. On the other side of the scale, we have the ambitious homeowner who wants a high-tech router that’s super smart and easy to monitor as needed. Like Google Wi-Fi, Eero is a mesh network router that comes with three devices that wirelessly link together, each covering around 1,000 square feet (speeds are roughly equivalent to AC1200). It can also route connections based on your current Wi-Fi needs to avoid problems. But Eero takes things a step further with security upgrades that have included automatic ad blocking, password management, and VPN setup. You can even use the app to set up parental controls, run speed tests at any time, and share your network with others. It’s also compatible with Alexa skills if you’re an Amazon fan! There are a couple downsides to this setup. For one, you need to pay a $100 annual subscription for the best security and password tools, and it’s pretty annoying that those important features are locked behind a paywall. Also, the router doesn’t have great options for connecting external storage. But it remains one of the most consumer-friendly, break-the-mold router options we’ve found, an especially good option for large houses. Any powerful router that can intelligently handle bandwidth demand will be a good gaming router, but if you’re looking for a router that’s specifically designed for intense gaming, you deserve this Rapture model. At AC5300, you don’t need to worry about streaming your 4K games. Plus, this tri-band router includes mesh software and adaptive QoS for targeting multiple devices to make sure that you always have a good connection, no matter what corner of the house you’re playing in. Other features include gaming ports, a dedicated ROG game boost mode, and proactive security. It’s got everything you need, especially if you stream your games. You will have to pay for the privilege though. Can a bracelet really let you control your dreams?